By now, many people know that famous ski resorts don't just close up shop when the warm weather comes. After all, the gorgeous mountain sides offer up the perfect setting for hiking, biking and camping while the springs and lakes in the area are perfect to cool off and enjoy watersports, swimming and fishing. So while many of the popular ski resorts are an explosion of excitement during the snowy season, they still welcome tourists and adventure seekers to enjoy the splendor of the great outdoors and the luxuriousness of the fantastic hotels and resorts. 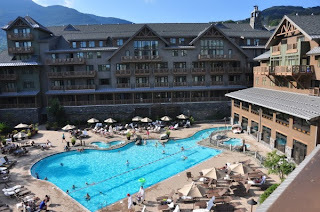 Fall in love with summer in Vermont at the fabulous Stowe Mountain Lodge. 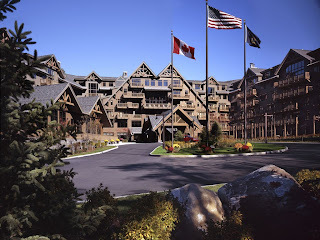 For over a century the Stowe Mountain Resort has been located in the pristine setting of the mountains of Vermont and has welcomed many distinguished guests. The area is fascinating with its covered bridges, crystal clear lakes, towering mountain peaks and vast forests that impress when either covered with a fresh layer of snow or when being warmed by the summer sun. Stowe Mountain Lodge has the most phenomenal summer activities, you might forget that it is a hot winter getaway. Rated #1 by Conde Nast for being the Best Golf Resort in the Northeast, link lovers will enjoy the manicured 36 holes at the Stowe Country Club, or up your game at the highly ranked and private Stowe Mountain Golf Club. If golfing isn't your thing, check out the lovely spa at Stowe Mountain and enjoy an unsurpassed experience designed for relaxation and rejuvenation. There is even a KidSpa option to ensure that even the little ones don't feel left out. The dining at the resort is impressive as well, making sure you don't go hungry during your stay. The award-winning restaurants tempt us to try fresh and natural local ingredients that you will not soon forget. But you will be doing yourself a favor by stepping outside and enjoying the clean air and beautiful surroundings. Outdoor activities are almost unlimited. Go zip-lining, take a wine tour, soar high above the ground in a glider or sit back and watch the birds. The standard outdoor activities also can be found, so make sure you enjoy all that the Stowe Mountain Lodge has to offer, inside and out. 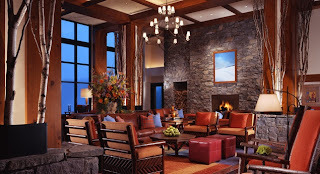 Regardless of the season the Stowe Mountain Lodge is a seductive travel destination that promises an unforgettable vacation. Book your stay with WhatAHotel! and enjoy Exclusive Complimentary Perks and Benefits that are simply fabulous. Get ready to check in and stay awhile, at the stunning Stowe Mountain Lodge.